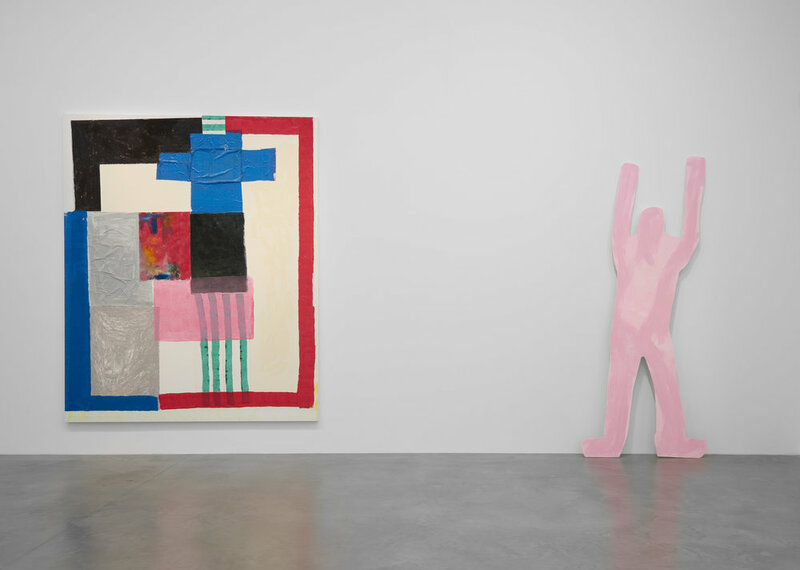 Emerging artists Boo Saville, Helen Beard and Sadie Laska have adorned the infinite white walls of Newport Street Gallery with their playful, but progressive explorations of colour. And what an impact these evocative paintings make. Upon entering the gallery, you are met by force with a provocative series of Helen Beard’s paintings. 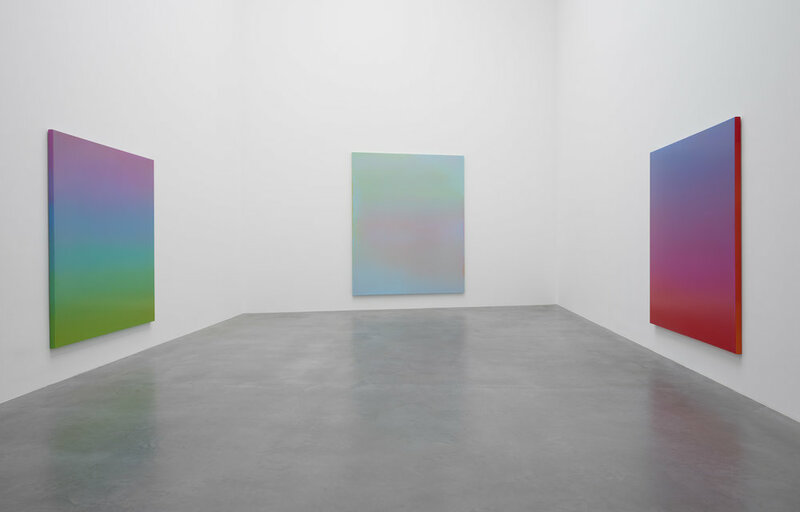 The viewer’s peripheral vision is sparked by a "rainbow colour palette" dancing one's eye across each canvas. Looking closer at each work, the colours steadily evolve into the suggestion of both male and female bodies. The dense colours exaggerate the curves of the human form as they explore the themes of gender and eroticism. In fact, the artist describes these forms as the shapes one experiences during a sexual encounter. Abstract or representation, Wet Wednesday (2017) and Big Night In (2017) extend from simply depicting the human form into becoming a variation on pornographic imagery. The works are then dramatised by the potency of her millennial pinks, lilacs and turquoises. Inspired by influential female artists such as Louise Bourgeois, Beard’s work both subverts and reclaims the male gaze. Boo Saville’s more subdued work is beautifully complimented by Beard’s vivid colours in the previous room. Akin to Rothko (and in my view Japanese landscape photographer Hiroshi Sugimoto) her works offer a calming and serene experience when navigating the space. Saville fills her large canvases in the second gallery with enveloping masses of colour; some pink, blue or green. No obvious figuration or indication of perspective is depicted, but rather it feels as if they dwell in their simplicity. Mercifully, so. One may think these works lack detail, but the artist uses as many as 40 layers of paint, which are sanded back. Perhaps playing on what you see is not what you get in the age of social media where truth is harder come by. Saville enhances these ideas through the liberal use of her subversive pinks. Her works are named after stars such as Orion and Ain giving them a sense of cosmic appeal. The calming works of Saville contrast the subject matter of American painter Sadie Laska. Her works are reminiscent of the post-Pop aesthetic of New York as she experiments with an additive process rather than reductive. Similar to Pollock, Laska adopts a performative element by often spray painting her work from a distance. In the work Oblique, she borrows, and renders abstract, the iconic Pepsi with its characteristic colours; blue, red and black. Tattered Ikea bags are also pasted onto her canvases as Laska's playful incorporation of recycled materials and found objects embodies the widespread consumerist tendencies of our time. All three emerging artists bring so much colour and energy to the gallery and you are left feeling uplifted by their fresh perspectives. They've proved Damien Hirst right in his brave decision to commission 21 paintings from these less-established artists. They are bright, challenging and energetic, as well as raising questions about our society that leave us with something to consider.